Since its inception at Vancouver’s Stanley Park in 1956, the Vancouver Aquarium has been internationally recognized for excellence in the display and interpretation of animal in its care. It was the first facility to incorporate professional naturalists into its galleries to explain animal behavior and natural history, and it has continued to find innovative ways to fulfill its promise to amaze and inspire its visitors. That mission has become much more of a challenging in the digital age. Where visitors were once content to look at the animals on display and read a little information about them on static signs, today’s TV-raised generation expects more flash and sizzle in the way information is presented to them. For the Vancouver Aquarium, that meant finding ways to build better connections with their visitors without detracting from the stars – the animals on display in the Aquarium’s many galleries. To fulfill on that philosophy, personnel at the Aquarium are continuously encouraged to push past the current boundaries and expectations of a facility of its type. Aquarium management would rather see them go a little bit out on the edge than fall back to the safety of what’s always been done. If it doesn’t work, then try something else. That is the approach Heywood and his team took when incorporating digital displays and digital communications solutions into the galleries. Their first attempt proved that digital screens could be integrated into exhibit galleries to enhance rather than detract from the animals. But as their needs grew, the existing system proved to be increasingly restrictive. The answer came when the Vancouver Aquarium engaged Four Winds Interactive (FWi) to develop a custom digital communications solution. Heywood chose FWi because of the breadth of capabilities of its software, the flexibility it offered and its ease of use. The Arctic Gallery is a good case in point, according to Heywood. It features several screens that present a lot of different content, such as Arctic issues, climate issues, territorial issues and, of course, little-known information about sea ice and Arctic animals. Additionally the gallery has a large 46” touch screen that provides a wide variety of helpful information to visitors. Move 30 feet away from the main screen and there are a number of touch panels that use FWi’s technology to host Flash video. Some are simple Flash interactive mechanisms, where you push a button to start the video, while others are heavily scripted (such as an interactive component that highlights beluga whale vocalizations.) Despite having widely different applications, they all run off the same FWi software. There also is a large plasma screen that runs 90-second environmental news segments – stories on the Arctic and issues affecting it that will raise the visitors’ awareness. One other significant addition to that screen was a live polar bear feed from Churchill, Manitoba- – a partnership between Vancouver Aquarium and Explore.org. The webcam showed the polar bears waiting to go out onto the ice in the fall, providing an unobtrusive look into their natural habitat. 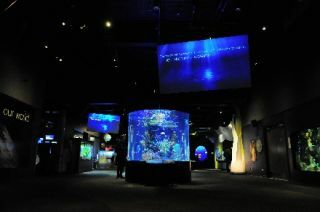 Here too, the Vancouver Aquarium was able to take advantage of the flexibility and scheduling functions within FWi. One of the most important benefits the Vancouver Aquarium realized was the ease of using FWi. The organization is currently using FWi to manage 25 screens throughout the more than 100,000 sq. ft. facility. The remaining screens will be converted to FWi in the near future, bringing the total to more than 50 screens that will be scheduled by one person and maintained by one other. Given that the Aquarium is a non-profit organization with limited funding, managing the process with so few resources is critical to its success. The content management system has been a huge time-saver for Heywood. The Vancouver Aquarium has between 500 and 1,000 items in its library that can be programmed. Any of them can be assigned to any screen simply by dragging and dropping. The items don’t have to be associated with a particular screen to be used there, which means Heywood doesn’t have to keep multiple copies of different items. Another positive is that the FWi system doesn’t rely on proprietary hardware or software. That future is coming upon the Vancouver Aquarium rapidly. Plans are in the works to add the ability for Aquarium employees, such as interpreters, to take control of any screen from an iPad to point out certain information, such as a behavior of a particular animal. The intent is to build better connections with visitors and help them to get more out of their experiences. Down the road, the Vancouver Aquarium may look into giving visitors limited control of the screens from their own iPads or smartphones. Yet, for all the cool technology, Heywood keeps in mind that the digital screens and the information they contain are there to support, not divert attention from, the reason people visit the Vancouver Aquarium – the animals.